The music program at Lakeside has a place for you! We have a graded vocal and handbell program which includes children, youth and adults. We believe that music provides the opportunity to experience the presence of the Holy Spirit in congregational singing and music ensembles. 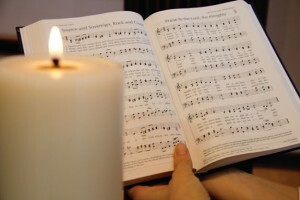 Music is integral to our worship and an important part of the whole church program. We include a diversity of ages, abilities, styles of music and types of choirs. Our choirs have performed major sacred works, musicals, and talent shows. Fellowship dinners often utilize the musical talents of our congregation as well. We also have taken our talents into the community and have performed in local and presbytery sponsored events. We belong to the Presbyterian Association of Musicians and regularly attend the Montreat Worship and Music Conference. The church also holds membership in the American Choral Directors Association and the Handbell Musicians of America. It is our goal to have the music program exhibit energy, enthusiasm and joy. One way to achieve this goal is to have new members join our choirs. Childcare is provided at the church for the rehearsals on Thursdays. Please feel free to come to any vocal rehearsal. If you are a handbell ringer, please contact Stephanie Nash, the Director of Music, at [email protected].